Before the tenth Doctor said goodbye to his companions one final time, he had a final adventure with Martha Jones, and it's one that new Doctor Who showrunner Steven Moffat would be proud of. Click through for a preview. 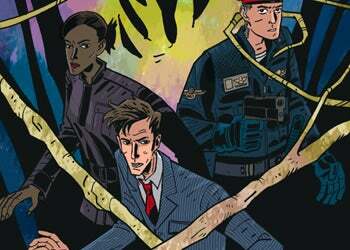 When The Doctor is called back to modern-day London by Martha Jones and U.N.I.T., the last thing he expects are the Enochian Angels of Elizabethan magician John Dee, the secret underground library of Greenwich Park, and an army of angry living trees! The issue is released this Wednesday.